The University recently initiated three projects (i) Indigenous Honeybee Protection (ii) Global Program on Pollination (iii) Real B-III (i.e. Built-Back-Better) Project for rehabilitation of agriculture and livestock in the earthquake affected areas of Khyber Pakhtunkhwa and Azad Kashmir. In addition, the Swiss Development Centre and the Agricultural University Peshawar are jointly working on PLI Project in the Southern Areas in Khyber Pakhtunkhwa. With USDA support, the Agricultural University has undertaken research to improve cultivation in the Federally Administered Tribal Areas (FATA) which face severe poverty and lack of agricultural development. The recent flood disaster have vanished the basic livelihoods of millions of people in Pakistan specially Khyber Pakhtunkhwa Province and FATA. As a result the standing crops, stored grains/food items and most of the livestock have been completely destroyed or partially damaged. In light of the above situation, Khyber Pakhtunkhwa Agricultural University Peshawar held workshops and created a task force to address challenges such as food stocks and rebuilding infrastructure. 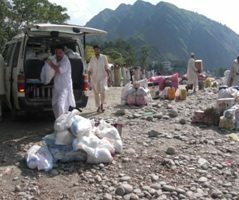 During the recent earthquake massive disaster in part of Khyber Pakhtunkhwa and Azad Kashmir, the Khyber Pakhtunkhwa Agricultural University provided financial, material, physical and moral help to the earthquake affectees. More than 60 faculty, officers and staff alongwith 400 students of the University worked in the field. The University established six camps in Abbottabad and Mansehra as focal points for relief activities. The transport of the University was engaged to provide food stuff and clothing and to transport medical patients. All the faculty and staff contributed 6 days salary in the Relief Fund. An educational radio station has been installed in the University’s Department of Extension Education to broadcast programs building create awareness for farmers regarding various techniques and problem solutions in the Agriculture field.